I can't believe it has taken me this long to discover the greatness of cabbage. It is so versatile, extremely healthy, and amazingly cheap. Last week I found cabbage for 33¢ a pound. 33¢!! I was very excited. I made a Indian-style cabbage and potato curry, and this tri-color coleslaw. The original recipe is from Cooks Illustrated, and although the texture was great, I felt it was lacking a bit in flavor. So I increased many of the ingredients -- a few more spoons of mustard, vinegar, and sugar, and used a mix of green and purple cabbage, and ended up with a deliciously creamy, flavorful, and colorful coleslaw. 1. Toss shredded cabbage and 1 teaspoon salt in colander or large mesh strainer set over medium bowl. Let stand until cabbage wilts, at least 1 hour or up to 4 hours. Rinse cabbage under cold running water. Press, but do not squeeze, to drain; pat dry with paper towels. Place wilted cabbage and carrot in large bowl. (The folks at CI recommend doing this to prevent a watery coleslaw. Unfortunately, I was in a rush so I skipped this step, but will probably do it next time as my coleslaw was a bit watery the next day). 2. Stir buttermilk, mayonnaise, sour cream, shallot, parsley, vinegar, sugar, mustard, salt (to taste), and pepper together in small bowl. Pour dressing over cabbage and carrots, and toss to combine; refrigerate until chilled, about 30 minutes. MsMeanie, the coleslaw is so colorful. It's like a work of art! In Brooklyn, I can sometimes find cabbage for $0.19/pound, so I definitely need to try this recipe soon. it does my heart good to see a coleslaw recipe that doesn't depend on mayonnaise for its creaminess. man, i hate that stuff. very colorful and lovely, msmeanie! While I don't LOVE cabbage. I do LOVE buttermilk flavored things. Plus that color is to-die for! You know what? I eat cabbage every single day. Why? It's so so so so cheap, and it's DELICIOUS! I love your creamy buttermilk version, I've gotta try it! By the way, are you M.S. Meanie or Ms. Meanie? that is the most gorgeous coleslaw ever. and i love that its got the buttermilk in it too! going to make this this summer for sure!! I read this the other day in my feedly, but when I clicked to comment, the post wasn't there! That happened to me a couple other times with you, our computers must have a dispute! I was going to tell you that I made this recipe from Cook's Country, I think, it was with a recipe for smoked pork which was also great. If it wasn't the same, it was very similar - I loved it! I like your substitutions, and am totally making it this way next time! What a colorful dish, it looks like the rare combination of a yummy AND healthy dish. I've been planning to make coleslaw for a few months now, but didn't get around to find the perfect beginners recipe yet. Maybe I'll try this -- buttermilk, mustard, and yogurt should make a really great dressing. To balance out my plans for making healthy food, I made your chocolate cupcakes yet again today. I can't help it, they're sooo sooo good. They remind me of this really wonderful surprise at my farewell party, too. Gosh, you just reminded me about coleslaw. Cabbage is indeed cheap now. I'd be making this recipe this week. 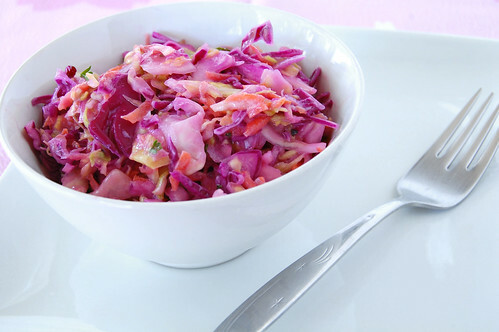 wat a lovely color, its a beautiful coleslaw! 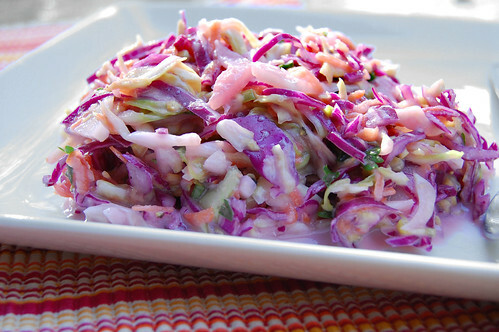 Super slaw recipe! And so pretty too! I do love cabbage, often just shred it and brown it in a little olive oil for a dinner veggie! msmeanie: can you email me thru my site? I'm seeing your posts on the feedly, but not on the URL... is my computer crazy?! I couldn't find your email on your profile either. I love cabbage! People look at me funny when I say that though :) And like you I often find that I have to tweak recipes, wonder if it's cos we're used to bolder flavours? Great looking slaw, so purply!